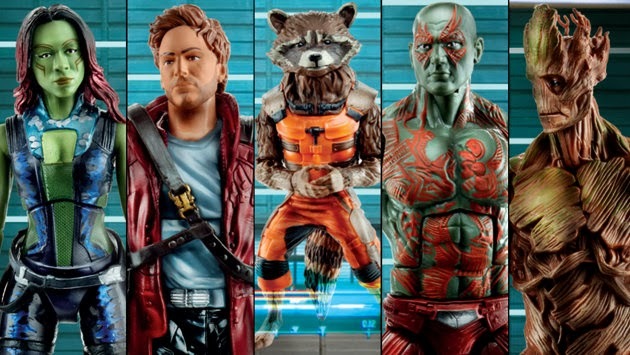 Via Yahoo, Hasbro has revealed images of their upcoming Marvel Legends figures based off Guardians of the Galaxy. These pieces are expected to hit toy shelves in July and have a $19.99 sticker price. “Marvel fans are already jonesing to see “Guardians of the Galaxy” later this year, and today we’re making the wait even harder as we present our exclusive first look at Hasbro’s accompanying action figure line via their special edition 2014 Toy Fair poster. As you can see below, Hasbro’s 8″ x 10″ poster was inspired by Marvel’s first official GotG image. 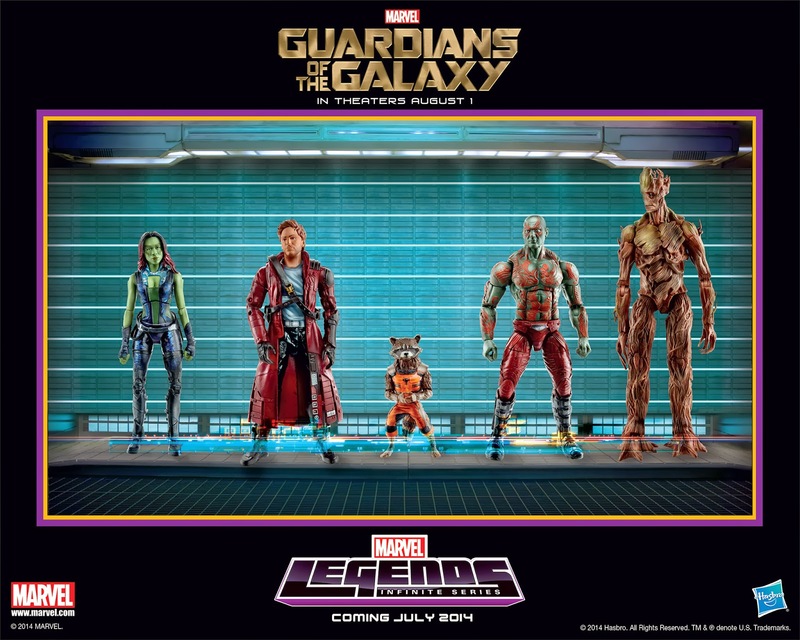 The big difference being the Toy Fair poster uses Hasbro’s 2014 Guardians of the Galaxy Marvel Legends Infinite Series six-inch action figures instead of actors. (Oh, to be immortalized in plastic.) The poster will be handed out to invited guests during the company’s presentation at the American International Toy Fair this weekend in New York. 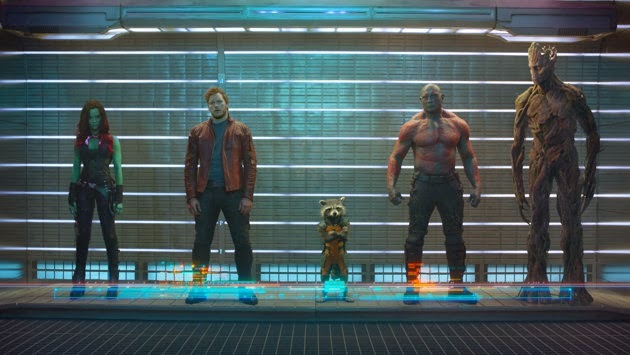 Hasbro's "GOTG" line includes six figures total. In addition to those pictured above — Gamora (played by Zoe Saldana in the film), Peter Quill/Star Lord (Chris Pratt), Rocket Raccoon (Bradley Cooper), and Drax the Destroyer (Dave Bautista) — attendees will be the first to see the two remaining figures when they're unveiled Saturday. And no, Groot (the tree-like creature voiced by Vin Diesel) doesn't count in this case because he's the Build-a-Figure character for the line; each figure comes with an extra piece that allows you to assemble your own Groot (and chop him down, if you see fit). Wow! These really look great, especially that BAF-Groot! While we may be partial to DC Comics here at Infinite Earths, we may just have to snap these up and place them within the office display! You Marvel fans out there probably can`t wait for these! Toy Fair is still two days away, and already Hasbro and DC Collectibles have given us a taste of what to expect at the show this year! Think it`s going to be another good one! Stay Tuned!